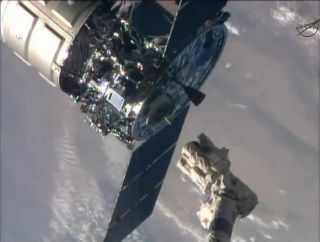 The Cygnus spacecraft as seen when it was released from the International Space Station on Aug. 15, 2014. A private cargo ship loaded down with trash left the International Space Station Friday morning (Aug. 15). Orbital Sciences' Cygnus spacecraft is due to plunge into Earth's atmosphere, burning up above the Pacific Ocean on Sunday (Aug. 17). The Cygnus craft launched to space on July 13 with close to 3,300 lbs. (1,496 kilograms) of supplies for the six astronauts on the orbiting outpost. "A flock of nanosatellites was also shipped to the station aboard Cygnus for future release from the Kibo laboratory module’s airlock beginning next week," NASA officials said in a statement. "Individually known as “Dove” satellites, the group will collect continuous Earth imagery documenting natural and man-made conditions of the environment to improve disaster relief and increase agricultural yields." Orbital Sciences' Cygnus spacecraft seen from the International Space Station after its release on Aug. 15, 2014.